Ernest was born in Hadleigh in 1889. 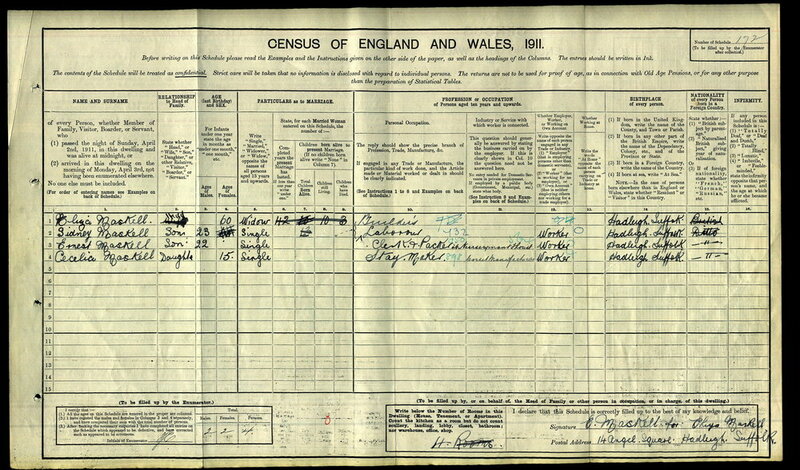 The 1911 Census report him living at home with his mother and siblings at 14 Angel Square. We know he joined the army at aged 18 and served for a few years before leaving in 1910. He remained a 'special reserve'. He married Alice Maud Perry at Falkenham on 23rd December 1916. The whereabouts of Ernest's actual medals is unknown, but he was entitled to the above three medals. We believe he joined the local territorial battalion, the 5th Suffolk after the outbreak of the war. We know he later joined the Essex Regt in the rank of Serjeant and he arrived in France with the 9th battalion on 30 May 1915. 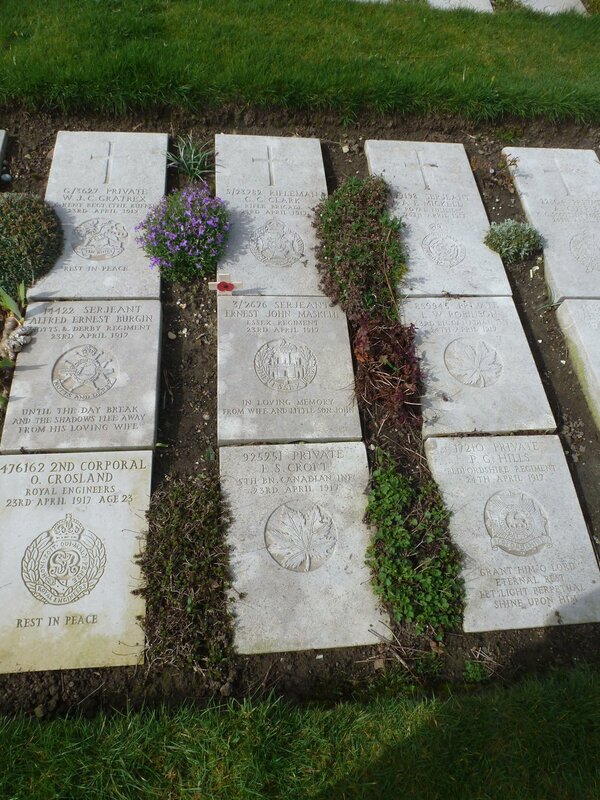 During the battle of Arras, the 9th Bn Essex Regt were in reserve and constructing trenches. When the 1st Bn Essex Regt suffered heavy casualties at Mochy, they were reinforced with 125 other ranks from another Essex Bn and we think this was the 9th Bn and this is when we believe that Ernest joined them. A composite Bn made up of the remnants of the 1st Bn, the men from the 9th Bn and men from the Newfoundland Regt held the ‘Brown Line’ a defensive line at Monchy between the 19th & 22nd April. This was a difficult task facing a determined enemy who were on the counter attack. At some point during these few days Ernest was wounded. He was evacuated to hospital at Boulogne. 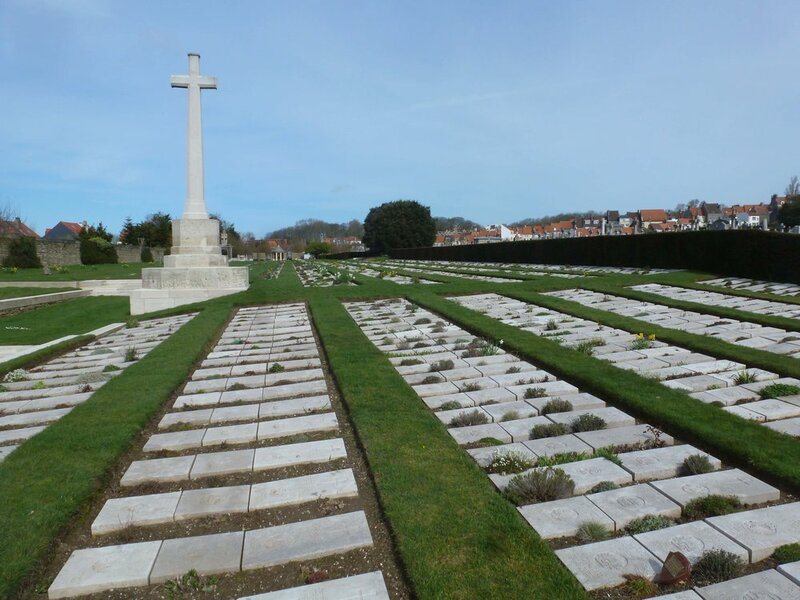 Ernest died of his wounds at Boulogne and was buried at Boulogne Eastern Cemetery. The headstones at this cemetery are laid flat because of the sandy soil. The words added to the bottom of the headstone by Ernest's wife refer to his young son. We hope that this page has been able to tell the story of Ernest John Maskell. If you know of any information which might help to add to the story then please get in touch.